"As a behavioral optometrist for 25 years, I have found the Read Without Glasses Method to be the most comprehensive and effective system to help my patients overcome presbyopia (the over-40 syndrome)." Dr. Marc Grossman O.D. L.Ac. "A modern application of vision therapy principles that really works. ... In some cases, it is even possible to give up glasses altogether. I highly recommend this approach." Dr. Robert-Michael Kaplan, O.D., M.Ed. "Combines the best of optometric vision therapy and natural vision exercises to create a simple and effective way to sharpen your vision. I've done it, it works!" Dr. Jacob Liberman, O.D., Ph.D.
"The Read Without Glasses Method" is a very effective approach for reducing the need for bifocals and reading glasses. The exercises are easy to do and require less than 10 minutes per day of practice. You will experience more relaxation in your eyes and better focusing power." "Patients who are diligent in working at it are very pleased with their less reliance on their reading glasses. I tell most of my patients about it." 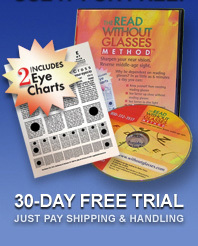 "The Read Without Glasses Methos is one of the best vision therapy tools that I've ever learned. Simple, easy and effective!"